Anytime. Anywhere. Affordable. Easy setup. Always on latest version. Designed for companies who prefer to have the PowerShark EQR database hosted and supported in a Links Technology datacenter this offering gives users the peace of mind knowing they have a secure connection to their data, without incurring the added expense of maintaining software and servers in-house. The hosted model also allows users to connect to the database from anywhere in the world as long as they have an internet connection. Concerned about security? You shouldn’t be. Our datacenters are some of the most secure in the world! We hold SAS 70 Type II and SSAE-16 SOC II certifications which are some of the most stringent in the industry. Some of the largest utilities in the country are using our Hosted Model for PowerShark EQR. 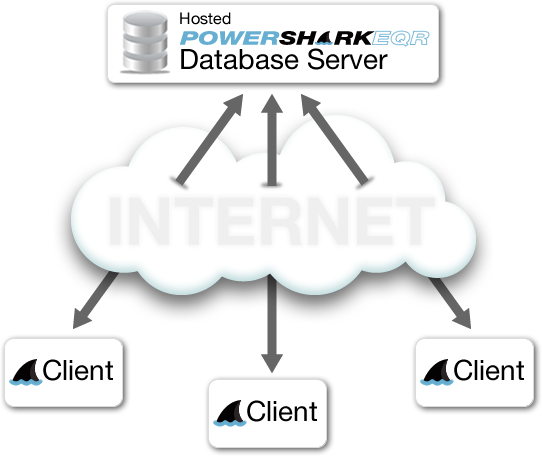 Under the Hosted Model, PowerShark EQR is billed under a “Subscription and Hosting” arrangement. Pricing is based off the total number of “new” quarterly transactions filed. If you file for multiple companies, then the cumulative total of all companies “new” quarterly transactions combined will determine which pricing level you fit in to. For an annual fee, the following services are included: automatic software updates, user and technical support, hosting and managing servers and infrastructure, data storage, data backup and disaster recovery services. Comprehensive online help and documentation is included, and video training can be added as an option. To learn more about PowerShark EQR training options, please visit the Training page. If you have questions regarding pricing, please contact the sales team. Over 50,000 transactions? Call 847-252-7286 for a custom quote.